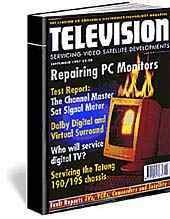 Each month Martin Pickering as "Jack Armstrong" writes a monthly "Satellite Workshop" column for "Television Servicing" magazine. Originally, they were accessible from the list, below, but we decided to "scramble" those pages and sell the compilation. It is simply too good to give away for free. You'll find it in the "Satellite" section. Click on "Books" at the top of this page. You can subscribe to "Television" magazine (and the others) or buy them at a newsagent. Jack Armstrong writes Satellite Workshop in "Television" - Magazine. The following pages have been scrambled but left in place because they were already listed on many search engines.